Following our successful drive to feed over a thousand orphans and widows this Ramadan we had a meeting to discuss the ongoing and permanent mission to help the needy, widows and orphans in our district. 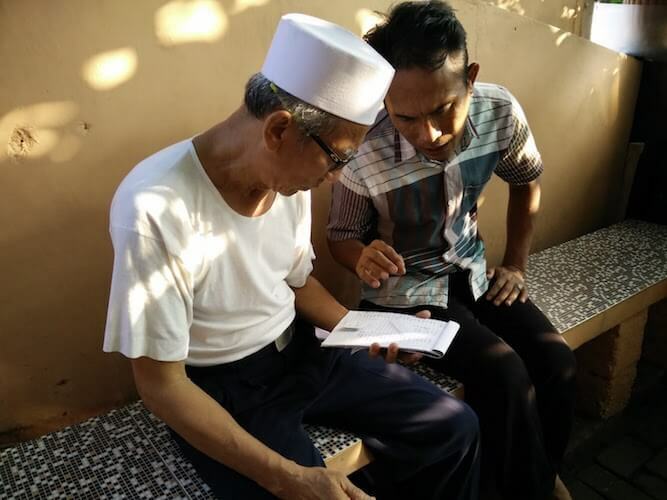 Pictured above is our community director Suwanta with Pak Suwadi who is the RW for our area. An RW is an official community leader and census worker for the government who knows every family in their area. We will work directly with the district head (Lurah) and the RW for each neighborhood underneath him to verify and keep an updated list of who is the most in need. From our initial consultation we have as many as 800 people in need within our district. After our consultation and meeting today we’re drafting a long-term plan to use the same organization and hierarchy as the government does to create a network of charity centers and monthly relief that can potentially cover every needy person reliably and in a way that will make a true impact. Over the next months we plan to begin a pilot of monthly relief at the RW level and then District (Kelurahan) while we also plan for long-term charity centers that will be self-sufficient to make a real impact in Indonesia, inshaa’ Allah.